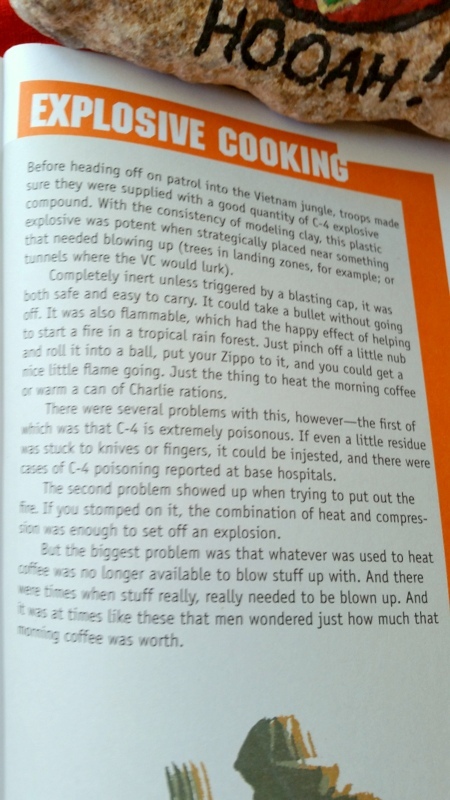 This is a page from one of my cookbooks, “How To Feed An Army: Recipes and Lore from the Front Lines”, which offers stuff like this “recipe for disaster”. Not sure if this information is true, but it’s the type of information which feeds folk lores… The HOOAH! rock is real for sure – it’s my husband’s from Mojave Strike ’95 and served as a handy paperweight to hold the book open. Thinking about the “facts”, from which Charles Krauthammer, forms his opinions and beliefs made me wonder about all this, because I believe that in 1998, when I posted messages on the Excite message boards, that I was cast as a right-wing extremist or threat of some sort. I believe that from those comments, my identity was investigated and they came upon a retired general who hates me – yes, he truly does. He gave me such an angry glare at a brigade picnic after Desert Storm that I was literally frightened. He went on to become a general. A few years after Desert Storm I found out that “some letters from some wife” caused a big stink after Desert Storm and the person trying to ferret information out of me, the paid volunteer coordinator for this post, informed me that she was close friends with that general’s wife. After this conversation, I was treated like a pariah among the other “leaders’ wives” and I began to ponder the “letters” she mentioned. By this point, my husband was a sergeant major. I wrote letters to my husband’s company commander during Desert Storm, to inform him about what was happening with the wives, back in Germany. My husband was a first sergeant at this time. These were personal letters, snarky in the extreme, and never intended to become public. I believe the husband of the woman, mentioned as petitesouthernbelle in my Messages of mhere saga, submitted those letters with his after action reports – that would be my husband’s battalion commander. Now, this whole thing about “moderate Syrians” vs Al Qaeda/ISIS nuts made me wonder how the CIA goes about determining that. I know that no one asked me anything before I was attacked in my own home, on American soil. Of course, my husband, who thinks that general’s stuff doesn’t stink, would never believe this highly-regarded commander would participate in some sleazy attack on a homemaker, but I believe he did. I believe this is the truth. Since 1999, I have been trying to prove this, because if I had not fought back and gotten lucky, I would not be free today, but instead would be locked up in a state mental institution. My crime was making fun of thatwitch2016 and her sewer rats’ lame legal arguments. And of course, I referred to her husband as BJ Clinton, in my usual snarky manner, so of course, that assuredly helped seal my fate as part of the “vast, right-wing conspiracy”. My goal is not that dish best served cold – revenge, but “justice”, because the powers of the Presidency and Army assets should not be used to attack American citizens over comments on a message board, especially when those comments were about following the rule of law, insisting that no one is above the law and arguing that lying under oath is unacceptable, no matter what the nature of the case. However, in a case on sexual harassment, one would expect questions of previous questionable sexual conduct to be reasonable. I intend to seek the TRUTH, wherever it leads.